We fix all your PVC needs. If you have a window difficult to close, a window that won’t open, a window that has insufficient seal thereby letting the draughts in, if you have dodgey handles on your window then we can fix your problems. If your doors are letting in the weathers or are hard to close or lock. Possibly the door won’t lock or won’t unlock then we can fix it. If you have lost/misplaced a key or simply have someone in possession of a key that you now regret then we can fix your problems. Maybe your PVC is damaged by an attempt to open a faulty door, a party that went wrong or simply by some accident then don’t worry we can fix it. Is the glass in your door or window cloudy with condensation or cracked or broken then we can fix it. If your window hinges are damaged in any way (frequently undetectable by the naked eye) then you may experience difficulty or stiffness when opening or closing the window. The other indication of hinge damage is usually that they are no longer keeping out draughts but all of these issues can be solved by hinge replacement. This is the locking mechanism that is operated by using the handle on the window. Frequently this seizes resulting in either the window not opening or being unable to close. Another sign is when the handle moves freely but the window does open. This can be solved by replacing the espagette. If you have lost the keys to the handles or the handle is broken, possibly just showing signs of wear then these can be replaced. These can be replaced if damaged. PVC when working correctly are the perfect barrier to the outside world. However, Over time you may find that you require to put more pressure when lifting the handle prior to turning your key in the lock. This in turn puts too much pressure on the gearbox that drives your 3 point or 5 point locking mechanism. This eventually results in a breakdown where upon you can’t either lock or unlock the door. Sometimes the handle will now turn a full 360 degrees which needless to say it isn’t meant to do. We can open the locked door and either fix or change the faulty part or even the complete mechanism as required to ensure that you have years more use from the door. Sometimes (frequently due to a key being used internally and externally at the same time) the key will not remove from the lock after you lock the door. This is caused by a slipped cam in the eurocylinder. We can solve this problem for you. Over time especially with a door which catches a lot of our sparse sunlight some PVC doors warp resulting in a stiffness of the handle when locking and draughts coming through the gaps produced by the warping. Also (especially doors with a lot of glass in them) drop so that they catch on the keeps or floor when opening and closing. Most doors can be adjusted to solve this issue. There are several things that can go wrong with Patio Doors. If they are no longer running smoothly then this can be either the runners that it rolls over or the wheels that run on these rails/runners. Theses can also be fixed by changing the faulty part. The next thing that can go wrong is usually to do with locking or unlocking the sliding door. This can be due to lost keys or a fault with levers, lock or mechanism but we can repair or change the faulty part to get the door fully functional again. Your sliding Patio Door can frequently be a weak point for a burglar to gain entry and to prevent this happening we can install secondary security to prevent this attack. 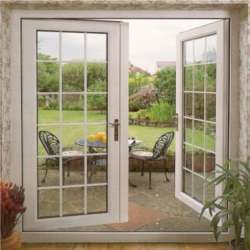 Frequently we get calls from customers confusing French doors with Patio doors as they both tend to lead onto a patio area or rear garden. The difference is essentially Patio door is generally half of the door is fixed in a closed position with the other half sliding past it to open. The French doors on the other hand can have both doors open with one door being the master door and requiring opened first following this the slave door can then be opened. Essentially these are almost like two single doors put together in one frame. Needless to say these can have several issues and all of which we can repair. If faults are detected early such as becoming more difficult to close/lock ie they are requiring more pressure to lift the handle to engage the locking system then if you act quickly then a repair can usually solve this problem rather than awaiting total locking/opening failure.